Hans-Peter Deigner currently is Professor of Pharmacology and Dean of the new faculty of Medical and Life Sciences.he is past president of ESBB.Hans-Peter has extensive experience in medicinal chemistry, omics and biomarker research including several senior management positions positions in Biotech companies.While holding senior management positions in biotech industry he has developed novel molecular diagnostics from the idea via the prototype to the final commercial product. From 2004-2006 he took up a chair in Biomedicinal Chemistry, University of East Anglia, Norwich, UK. 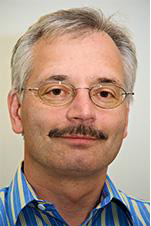 Hans-Peter Deigner graduated in pharmaceutical chemistry, Heidelberg University, Germany and after a position as research associate at Harvard Medical School returned to Heidelberg to finish his habilitation and to work as group leader and senior lecturer/associate professor. 4. Molecular diagnostics and individualized therapy.